Executive Order 9066 authorized removal of Japanese Americans from designated military zones on the West Coast and their detention in internment camps. Between 1861 and 1940, approximately 275,000 Japanese immigrated to Hawaii and the mainland United States. When the Empire of Japan attacked Pearl Harbor on December 7, 1941, lobbyists from western states, many representing competing economic interests or nativist groups, pressured Congress and the President to remove persons of Japanese descent from the west coast, both foreign born (issei – meaning “first generation” of Japanese in the US) and American citizens (nisei – the second generation of Japanese in America and US citizens by birth) under the pretext that they were a national security threat. During Congressional committee hearings, Department of Justice representatives raised constitutional and ethical objections to the proposal. As a result, the US Army, rather than civilian law enforcement, carried out the task. On February 19, 1942, President Franklin D. Roosevelt issued Executive Order 9066 authorizing exclusion, and Congress implemented the order on March 21, 1942, by passing Public Law 503. The West Coast was divided into military zones. 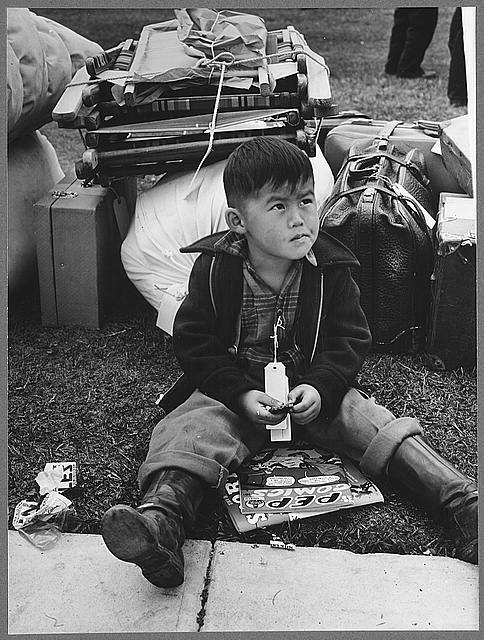 After encouraging voluntary evacuation of the areas, the Western Defense Command began involuntary removal and detention of West Coast residents of Japanese ancestry. During the next six months, approximately 120,000 men, women, and children were moved to assembly centers. They were then evacuated to and confined in isolated, fenced, and guarded camps, euphemistically known as "relocation centers." The ten relocation centers were in remote areas in six western states and Arkansas: Heart Mountain in Wyoming, Tule Lake and Manzanar in California, Topaz in Utah, Poston and Gila River in Arizona, Granada in Colorado, Minidoka in Idaho, and Jerome and Rowher in Arkansas. Nearly 70,000 of the evacuees were American citizens. The government made no charges against them, nor could they appeal their incarceration. All lost personal liberties; most lost homes and property as well. Although several Japanese Americans challenged the government’s actions in court cases, the Supreme Court upheld their legality. Nisei were nevertheless encouraged to serve in the armed forces, and some were even drafted. Altogether, more than 30,000 Japanese Americans served with distinction during World War II in segregated units. February 19 - 26, 1942 News articles about President Roosevelt issuing Executive Order 9066. February 20, 1942 - May 1942 News, editorials, op-eds, letters to the editor, and cartoons reacting to Executive Order 9066 and the proposed evacuation and incarceration of Japanese Americans. December 1941 - February 1942 Editorials, op-eds, letters to the editor, and cartoons arguing for or against evacuation and incarceration of Japanese Americans. August 7, 1942 - September 1942 News, editorials, op-eds, letters to the editor, and cartoons regarding the forced evacuation and incarceration of Japanese Americans.